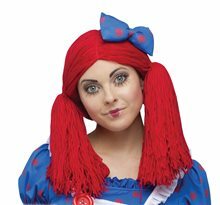 Rag Doll Child Costume.Includes: Dress with Ruffle Trim and Bonnet with attached Bangs and Braids.Available Size: Child - Small (4-6), Child - Medium (8-10), Child - Large (10-12). 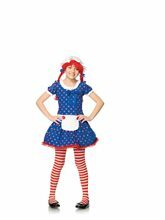 (See Size Chart For More Information)*Petticoat, Striped Tights and Shoes Not Included.Rag Doll 2pc Child Costume includes blue dress with red polka dots and attached white apron with red buttons, and bonnet with attached braids and bangs. 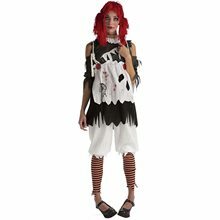 Darling Dollie Adult Costume.Includes: Dress and bonnet. Available Size: Womens - XSmall (0-2), Womens - Small (4-6), Womens - Medium (8-10), Womens - Large(12-14). (See Size Chart For More Information) *Shoes and Stockings Not Included. Accessories Sold Separately. Material: 96% Polyester/4% Cotton.Care Instructions: Hand wash cold. Only non-chlorine bleach when needed. Drip dry. Do not iron.Darling Dollie includes layered dress with sweetheart keyhole back and printed lace up detail, attached felt heart apron with button accent, and matching bonnet.Made in China.